Water resistance is the term used to show the amount of water pressure that a watch can withstand at a particular depth without getting damages or losing accuracy. Over the past few years, we have been using the word waterproof. But now, it has ended. As a matter of fact, water resistant is the term approved by the Federal Trade Commission. They disallow waterproof. If you are a bit confused between water resistance and depth, they are not the same. Every watch is tested at a certain depth with a temperature from 18 c to 25c. Note, the test is carried out while an individual is stationary. This is done because any movement under the water can result in additional and extreme pressure changes. So, a watch may either be partially or potentially damaged. 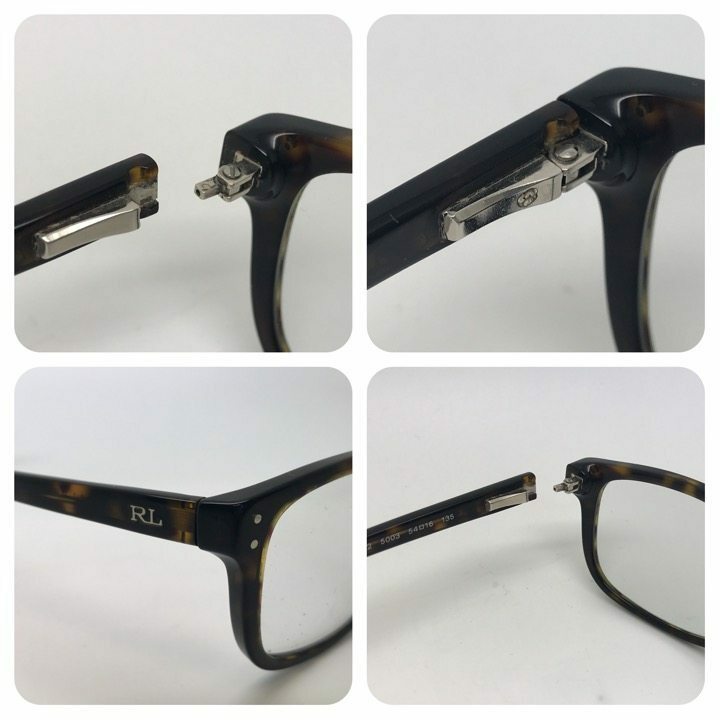 Even though it is water resistant and made of the highest quality or the finest material, your investment might lose its real and aesthetic value. If you are fond of playing any water sports activities, they are one of the factors that can exceed to the water resistance of your watch. The same thing goes in using a hose. To protect your watch and make it a magnificent investment, avoid wearing it during swimming and bathing. Water resistance has also several degrees. To know more information about them, search online. With just a click of a mouse, there are a ton of valuable results in NO time. Apart from that, you can ask help from a qualified and competent professional. At the end of the day, you will be properly informed and guided. Also, it is important to note that watches should not be worn during a bath. In addition to the great pressure from the shower, soaps and shampoos are fully packed with chemicals that will damage its gaskets. Fortunately, there are a number of responsive and relevant products in the market. However, they are a bit expensive that can break your bank. To cut costs and acquire big savings, it is better to take it off in the shower. This will also help you avoid repair and replacement expenses. Furthermore, a burdensome or inconvenient experience will not be possible. When looking for a water resistant watch, you will find a good choice in real time. With a plethora of option in the industry, making a shopping decision will be easier and simpler. Despite the water resistance of your option, there is no such thing as permanent. There is no guarantee that your watch can resist any water pressure within a long span of time. Although you bought it from one of the most reputable providers, it still has a high risk to lose its functionality and accuracy. Too much water pressure exposure can greatly affect its durable value and stunning design all of a sudden. Unlike other watches available in the market, these will leak when the water gets on the crown or the case. So, take advantage of water resistant timepieces. Although its resistance is not permanent at all, it would give much help. Generally, water resistant watches can resist minor moisture. However, never wear them for diving, showering, and swimming. Even they are water resistant, they are not long-lasting. Never believe on what appears on the packaging of your choices. They are just hifalutin phrases to entice a range of avid watch collectors. Though water resistant watches should not be worn during bathing, it does not necessarily mean you cannot wear one of them. With these 50 METERS, 164 FEET/ and 5 BAR, you can use it for swimming. But, the water should be shallow. Furthermore, they are not the best choices for a range of water sports like snorkeling. When looking for timepieces that are relevant for aqua diving and high impact water sports, these 200 METER / 662 FEET and 20 BAR are the best options for you. There is no need to have a time-consuming and overwhelming shopping as these watches are specially tailored to cater your needs. Apart from that, they can go above your criteria. They are also available in a broad range of magnificent designs that will give you an outfit lift. You will look prim and proper and all your co-workers will admire you for a good fashion sense. Also known as professional divers watches, these are an ideal choice for deep water diving. Just prepare your pocket as these may be available at a price you cannot afford. Nevertheless, wearing one of these timepieces is worth spending for. With their water resistance and durability, you can dive in the water any time of the day. You do not have to take your watch off. So, your choice can avoid any hassle. You will never miss a perfect and spectacular view under the sea. To know whether a watch is water resistant or not, you can see it on the case back. But, take a reliable brand into account to eliminate an inefficient choice. Also feel free to visit or explore its site for more details about the company and services as well. When depth specification is not available and a timepiece is said to be water resistant, it is specially catered to water resistant specifications. Water resistance does not really last. As a matter of fact, the gaskets and case back have the tendency to wear. After a long time, they will start to deteriorate. This is why a regular inspection should not be overlooked. A knowledgeable service provider starts checking the gaskets of a water resistant watch during an inspection. They may apply silicone lubrication, which can extend the life of your gaskets. Usually, it is done when the cell needs to be replaced. So, there you go all the information about water resistance. We hope that you learn something out of it! The term water resistance sometimes gets a wrong interpretation. When it says that a watch is water resistance, some are thinking that it can’t be damage or cannot be in a soaked condition. But the term water resistance is far too different in the term such as waterproof. Water resistance can protect but not as deep as the far endings of the sea from the atmosphere. 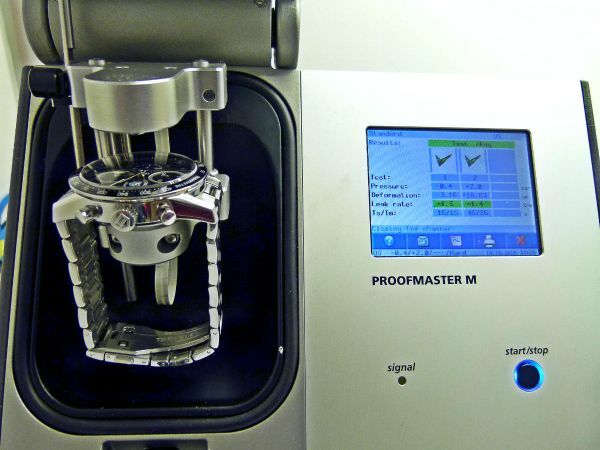 Same in the production of water resistance watches. Manufacturing firm doesn’t guarantee our watch is not entered by water. As for the present times, there is a lot of confusions regarding the subject. As long a watch is branded as water resistance it can have a contact in the water and to its extent limits. For the record, water resistance watch manufacturer doesn’t produce the very degree level of the watch where an average person can reach down under water. The deep under water pressure is being a concern of the manufacturer. Due to litigation in the year 1960s to 1970s, there is at least one record of death attributed in diving underwater. The incidence is recorded to have a failure with the record when the air data in the meter is affected by the pressure underwater. With this incidence, the manufacturer doesn’t claim to create a waterproof watch. Instead, they produced water resistance watch with a limited number on how deep the watch can take before it is affected by water pressure. 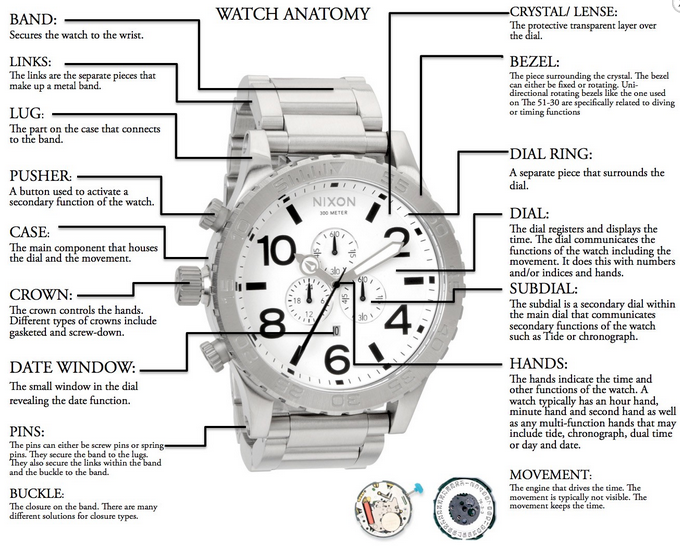 The United States claimed that in their country there is no watch to be manufactured labeled water proof watch. To be able to measure the water resistance of watch it has to be in a motionless state or static. 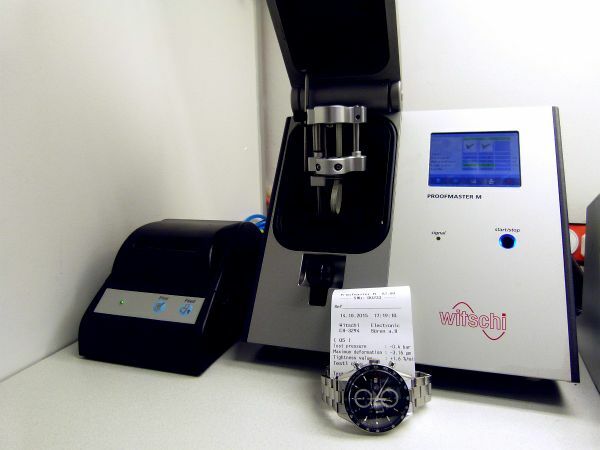 The amount of pressure can affect the data in measuring the water resistance if the watch. While diving in a pool the amount of pressure is affected by the force in every stroke. It is advice that you should take care of your watch and never put it to its limit. It has to a high level in maintaining the moisture of the watch. It is natural that as the watch ages the effects of the gaskets can be too brittle and dry. 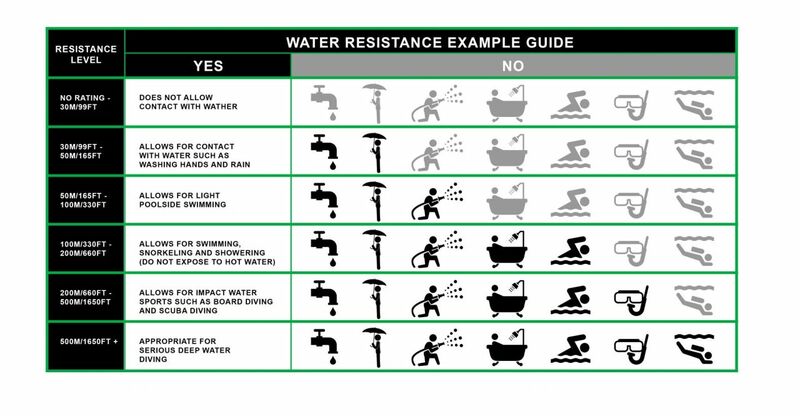 To the extent that it will lose the effect in resisting water. The environment can be another factor to take an effect on the water resistance technology of the watch. Exposure in the pools that have a high amount of chlorine can be the cause of less tight seal of the gaskets. If it can’t avoid that the watch is exposed to the pool with a high amount of chlorine, the manufacturer suggests that you have a yearly checkup and replacement of your watch. While diving in the pool or having a contact with water make sure that you have secure the locks of the crown and the tiniest hole that can be the passage of the water inside the watch. As much as possible do not open the watch when it is wet or in contact with water. This will be the cause of damage inside that watch and produce moisture. If this happens, go directly to the manufacturer and ask assistance or ask them to repair it. There is a case that an amount of moisture or fog can be seen inside the watch. This is just natural due to the sudden change in temperature but it can disappear one the temperature is generated and back to normal. There is no need to panic with this situation, the expert says that it natural and will disappear in an instance. All water resistance watch determines the capacity of water resistance level by looking at the back case of the watch. The gaskets of the watch are the most important and the most sensitive material in manufacturing a water resistance watch. The temperature is the reason why the gasket is being damaged and the result of damage. The result is a loose sealing of the watch and moisture can potentially enter inside. As much as possible it is advised that you take off your watch when you are entering a Jacuzzi or hot tub. While an exposure to a hot temperature can affect the shape of the gasket that will be the reason for water and moisture to enter inside the watch. Some back case of a water resistance watch doesn’t indicate the limit of water resistance can handle. In that case, an extra precaution should be observed. The term means that the amount of water exposure can handle due to sudden contacts. The amount of water pressure it can stand range 333 feet or 100 meters. You can wear this type of watch when you are showering with the natural temperature. Most of all it can stand an exposure in a swimming pool but be sure to rise the watch every time it has a contact with water to avoid moisture and fogging. This type of watch can stand the water pressure of 666 feet or 200 meters, double the water pressure standing ability of the WR10. Is can stand stressful activities for the watch such as the SCUBA diving recreations. Like the other types of the watch be sure to rise the watch to avoid damage and fog inside the watch. Rise it and make sure that id dry by wiping it with a fresh and clean cloth.